Excerpted From Keith Arnold's "Five things we learned: Notre Dame vs. Utah"
It was an analogy Brian Kelly didn’t want to use, but football is a lot like the game of life. Ebb and flow. Highs and lows. Good and bad. And after three solid weeks of nothing but negativity, Kelly’s Notre Dame squad went out on Senior Day and summarily dispatched Utah 28-3 on Saturday afternoon. After counter-punching much of the first quarter and spotting Utah a field goal on a failed fourth down gamble, the Irish got a big special teams play from cornerback Robert Blanton, who blocked a punt and returned it for a touchdown. From there, the Irish systematically beat down the No. 15 Utes, giving the Irish their biggest win over a ranked opponent since 2005. Any hope Utah had of overcoming a 14-3 halftime deficit was eliminated thirteen seconds into the second half, when freshman Austin Collinsworth stripped Shaky Smithson on the opening kickoff and Tommy Rees found senior Duval Kamara in the corner of the endzone to push the score to 21-3. Kamara would add another touchdown catch in the third quarter to seal the deal. After losing a plethora of starters and last minute games to Michigan, Michigan State and a shocking defeat to Tulsa, the Irish finally came unbridled, finding their stride. “You saw today a football team that didn’t have on their shoulders the traditions and reputations and all the things that you have to worry about sometimes being a football player at Notre Dame, and they just flat out played,” Kelly said. And for the first time since the gallows of 2007, the senior class walks away from Notre Dame Stadium with a win, celebrating with a student section that had no intent of leaving the field. Bob Diaco’s defense was astounding in every sense of the word. If a coaches reputation can be made (or ruined) in one Saturday, Bob Diaco tested the theory during the Irish’s loss to Navy. Unable to solve even the most rudimentary elements of the Midshipmen offense, Diaco admitted that the 35-17 loss was his most frustrating as a defensive coordinator. While Kelly caught some flack for keeping Diaco and offensive coordinator Charley Molnar away from the media this week, the move obviously paid dividends, as Diaco’s defense put together their most complete performance of the season, holding a Utah team that averaged 41 points a game to a single gimme field goal, one that was courtesy of an offense that turned the ball over on downs at midfield. How dominating was the Irish defense’s performance? Consider that it was only after the score was 28-3 that Utah put together a drive that was over 24 yards. The front seven of the Irish defense completely dominated the line of scrimmage, holding a powerful Utah running game to 2.4 yards a carry and under 100 yards, even without interior stalwarts Ian Williams and Carlo Calabrese. The pass rush pressured Utah quarterback Jordan Wynn endlessly, and the secondary blanketed Utah receivers, with Harrison Smith making the best interception of his career and Gary Gray in the right place at the right time all day. 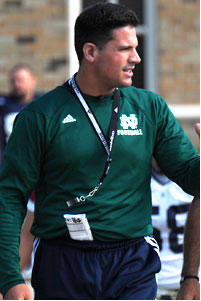 Diaco deserves all the credit in the world for dialing up a game plan that terrifically suited an Irish defense still incredibly thin due to injury. Even more impressive, the development of the defensive roster is incredibly apparent after 10 football games, with freshman like Prince Shembo and Kona Schwenke making big plays, and guys like Kapron Lewis-Moore and Sean Cwynar rising to the occasion. It’s easy to see how defensive line coach Mike Elston, linebacker coaches Diaco and Kerry Cooks, and secondary coach Chuck Martin have put their fingerprints on this unit. Their performance might get lost in the shuffle, but it certainly shouldn’t tonight.